Charles Carpenter, married to Caroline Kelley, bought 123 acres on the southwest corner of the island from the Kelley family around 1810. Mr. Carpenter was a prominent horticulturist. He planted Catawba grapes that were slow to mature but good grape to tolerate the Ohio weather and soil. He planted different varieties of grapes but the Catawba was the hardiest. He took his wine to the 1853 Ohio State Fair and won the State. He also won national and international competitions. He had one of the first winerys north of Cincinnati. A wine cooperative was established in 1865 and was called the Kelley's Island Wine Company. The smaller winerys were encouraged to sell their grapes to the new company because a larger company could better market the island wine. The new company rented cellar space for 5 years from Carpenter until they could build a the cellar. For more information about Charles Carpenter, visit this Ohio Genealogy LINK. 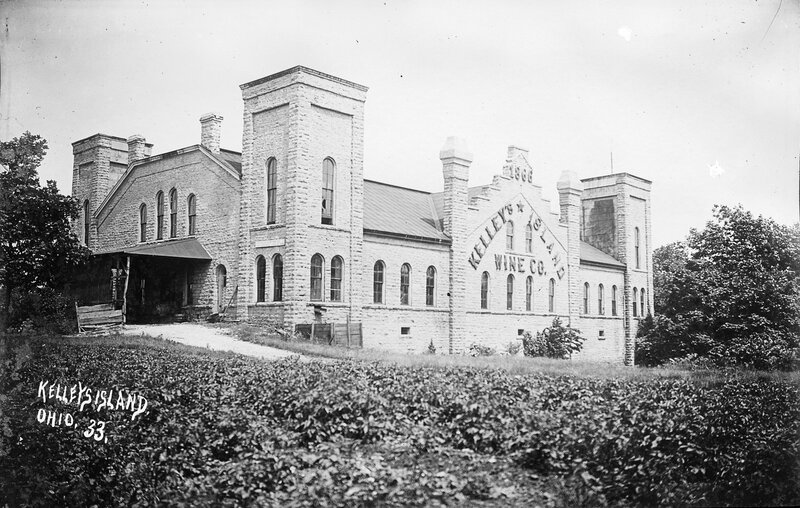 Kelleys Island Wine Company build their first cellar in 1872, and they were producing 163,550 gallons of wine. The winery burned in 1876 and they replaced it with a much larger one in 1876, using stone from the old quarry. It looked like a feudal castle and was able to store over 350,000 gallons of wine. They started making Champagne and entered it into the Philadelphia Cnetennial Exposition in 1876. It earned a Grand Medal Honor. By now, the winery was crushing 9,000 tons of grapes that were produced from 2,000 acres of vinyards. They were producing champagne, Catawba and Reisling wines and some ports and clarets. Wines were being shipped throughout the US, Canada, Great Britain and Germany. Most of the grapes were grown on the southeastern shores of the island, and in the Sweet Valley region. French botanist, J.E. Planchor visited the winery in 1873 and described how the winery worked: Grapes were brought in by wagons from all over the island, weighed, paid for on the spot, and sent by a steam-driven conveyor to the top floor of the winery, where they were crushed, destemmed, and the juice separated from the skins. The juice when went to the fermentation vats on the second floor, while the skins descended to the ground floor, where six great steam-powered presses, each one capable of handling three tons of material in six hours, awaited them. Below ground were two levels of vaulted cellars for the storage of wine in both casks and bottles, including champagne storage. The wines were made and bottled as varietals, including Concord, Ives Seedling, Delaware, Isabella, and Iona. Wine was shipped from the south dock. 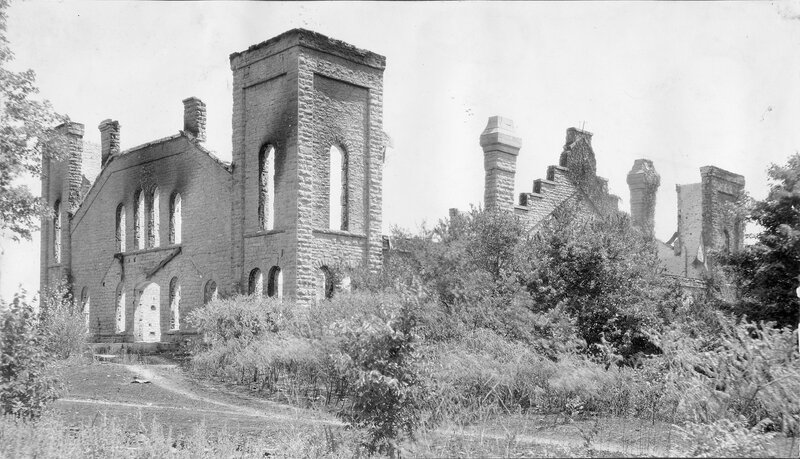 The winery burned again in 1915 and was again rebuilt. Kelley's Island Winery was the only winery on the island that changed from wine production to grape juice production for Prohibition before it burned a final time in 1933 and has been in ruins ever since.The winery ruins are presently in disrepair and are on private property so it is not open to the public. 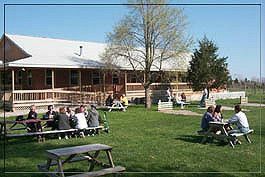 The present Kelleys Island Winery located on 418 Woodford Rd. It is housed in a newer building and has a good selection of food and wine.